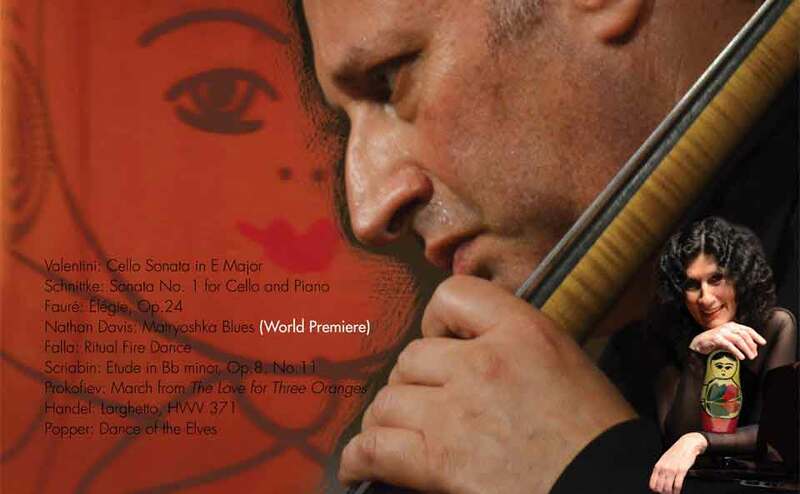 World Premiere of "Matryoshka Blues" by Jazz Composer Nathan Davis Performed by Classical Cellist Misha Quint Highlights InterHarmony International Festival Concert at the Weill Recital Hall at Carnegie Hall, January 25 at 8:00 p.m.
One of the highlights of InterHarmony International Music Festival's January 25 concert at the Weill Recital Hall is the world premiere of American jazz musician and composer Nathan Davis's "Matryoshka Blues" composed for the Russian émigré cellist Misha Quint, founder and director of the InterHarmony Festival. The new work's title "Matryoshka Blues" has a double reference pointing to its Russian-born instrumentalist and the jazz roots of its composer. Like matryoshkas, the small, colorful Russian dolls that are embedded one within the other, Davis's new work is comprised of different layers of sound, which together showcase the full range of musical possibilities for the cello within the jazz form. Svetlana Gorokhovich accompanies on the piano. 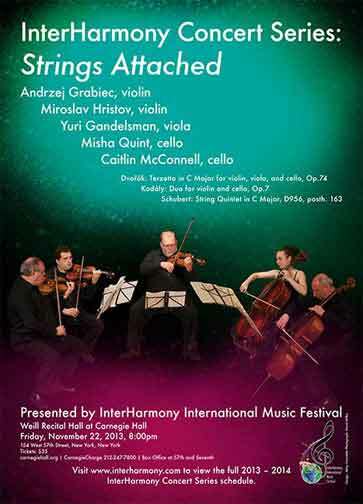 In addition to the Davis premiere, the concert, the second of InterHarmony's three at Weill this season, includes a series of dramatically different works culled from four different centuries. 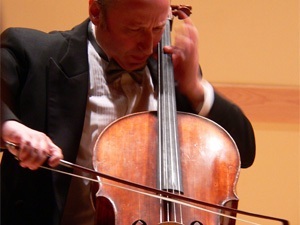 The concert opens with music from the 18th century: Giuseppe Valentini's "Cello Sonata." Originally composed for the violin and demanding great virtuosity from its performer, "Cello Sonata" was then arranged for cello by one of the 19th century's greatest cellists, Alfred Piatti. The relatively short piece is followed by the emotional roller coaster ride within Alfred Schnittke's "Sonata No. 1 for Cello and Piano." Written in 1978 and given to the cellist by the composer, the work demands full use of the cello, from its highest notes to its lowest tones, creating an exciting and wildly changing cycle of sounds, beautiful, thunderous, and disturbing. The second half of the program begins with "Matryoshka Blues" then travels back in time to Fauré's 19th-century "Elégie, Op. 24," followed by Manuel de Falla's "Ritual Fire Dance" and Alexander Scriabin's "Etude in B flat minor, Op. 8, No. 11." Prokofiev is represented with the March from his beloved opera, "Love for Three Oranges," using a transcription for cello and piano by Mstislav Rostropovich. 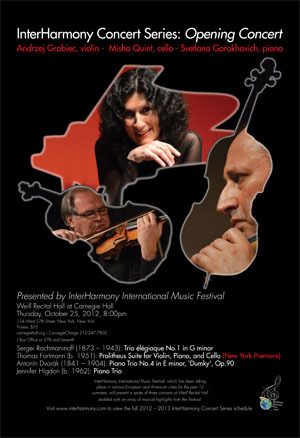 Following is a performance of George Frederick Handel's "Sonata for Violin and Basso Continuo in D major, Op. 1, No. 13," transcribed for cello and piano. The concert concludes with David Popper's short, charming and technically demanding "Dance of the Elves." The Bohemian composer is well known for expanding the technical possibilities of the cello. NATHAN DAVIS Saxophonist and composer Nathan Davis is currently director of the jazz studies program at University of Pittsburgh, widely considered one of the most successful university jazz programs in the world. Davis founded the university's annual jazz seminar and concert, which marked its 40th anniversary this fall and is the longest running American jazz event of its kind. Davis received his bachelor's degree in music education from the University of Kansas in 1960. In 1974, Davis earned his Ph.D. in ethnomusicology from Wesleyan University. After college, Davis served two and a half years in the U.S. Army's 298th Army Band in Berlin, Germany. Upon discharge, Davis remained in Europe, mainly working with Pittsburgh-born drummer Kenny Clarke for the next seven and a half years. In Paris, Davis taught, performed and recorded with some of the era's most elite jazz stars, including Donald Byrd, Eric Dolphy, Woody Shaw, Art Blakey's Jazz Messengers, Bud Powell, Ray Charles, Johnny Griffin and Dexter Gordon. Davis enrolled at the Sorbonne in 1967 to study ethnomusicology. He studied composition with French composer André Hodeir in 1968 and composed over 200 original compositions including film scores, four symphonies, and in 2004, premiered his opera, "Just Above My Head," based on the book by James Baldwin. He has published four books including a scholarly text on the history of jazz. For the past fourteen years, Davis has served as faculty director for the Jazz Ahead program at the Kennedy Center for the Performing Arts, and has been a Jazz Master faculty member at the annual Ravinia Festival in Chicago each summer. Davis served as the musical director for the Thelonious Monk Institute's Steans Music Institute Summer Jazz Program in Aspen, Colorado. 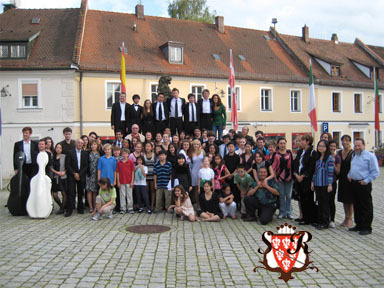 In December 2010, he was an artist at the newly formed Jazz Masters München Program, held in Munich, Germany. Davis has recorded over twenty LP's (CD's) as leader, and several videos, with groups like the Paris Reunion Band, Roots and others. He is the founder and editor of University of Pittsburgh's prestigious International Jazz Archive Journal, which is distributed to more than twenty countries throughout the world. With a grant from Gulf Oil Corporation, Davis recorded and produced an LP titled "Nathan Davis: A Tribute to Dr. Martin Luther King, Jr." for the annual "Hand in Hand" celebration of Martin Luther King Week. His recording, "I'm A Fool to Love You," can be found on the Tomorrow International, Inc. label, with Grover Washington, Jr. as a special guest. In 2005, Davis released "The Other Side of Morning" and most recently released "Parisian Hoedown," both on the Tomorrow International, Inc. label.